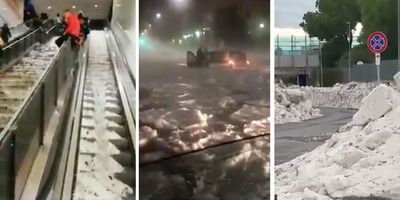 Twitter/severeweatherEU/Business InsiderThe hailstorm in Rome and its aftermath. A hailstorm hit Rome on Sunday, blanketing the city in ice and creating rivers of meltwater. Some drivers were trapped in their cars and small rivers ran down the escalators in underground Rome Metro stations, forcing some to close. The bad weather also affected other areas of Italy, including Milan, Bologna, and Sicily. Videos on social media showed the scale of the cleanup operation in Rome, as tall banks of hail lined the streets. A freak hailstorm covered Rome in ice on Sunday, leaving drivers trapped in their cars and creating rivers of freezing water on the streets and in the city’s subway stations. In photos posted on social media, the city, which had been experiencing mild weather, looked as if it was covered in snow. Footage showed the hail blanketing the ground. The conditions left some drivers trapped in their cars as the hail collected and meltwater flooded roads. These floodwaters poured into underground Metro stations, creating rivers on the escalators. At least six Metro stations and one aboveground station were closed, The Local, an Italian news site, reported, adding that all had reopened by Monday morning. The weather also reached other parts of Italy, including Milan, Bologna, and Sicily. Coldiretti, an agricultural association, called the sudden hailstorm a “calamity for Italian farming,” according to the Ansa news agency. Footage on Monday showed huge amounts of hail on the side of Rome’s streets amid cleanup operations.